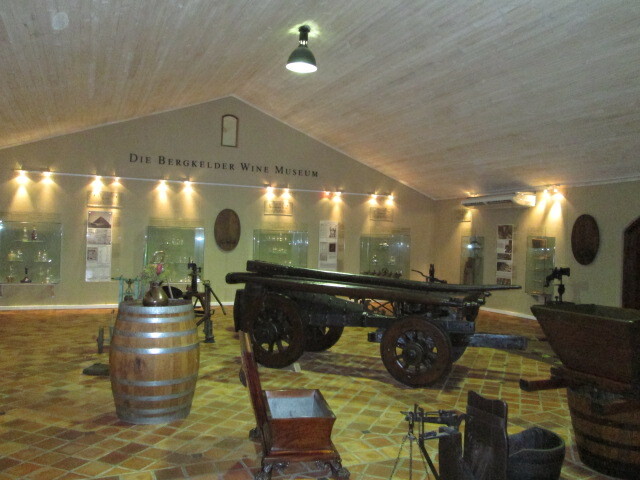 On previous visits to the Cape we have ummed and ahhed regarding a visit to Die Bergkelder (literal translation, the mountain cellar), which falls under the large corporate Distell banner. We decided to do the tour this time. One can be put off by the fact that they also do an ‘Artisanal salt tasting’ which sounds a load like bs to me. Our cellar tour guide Dillon was very informative and fielded our questions well. 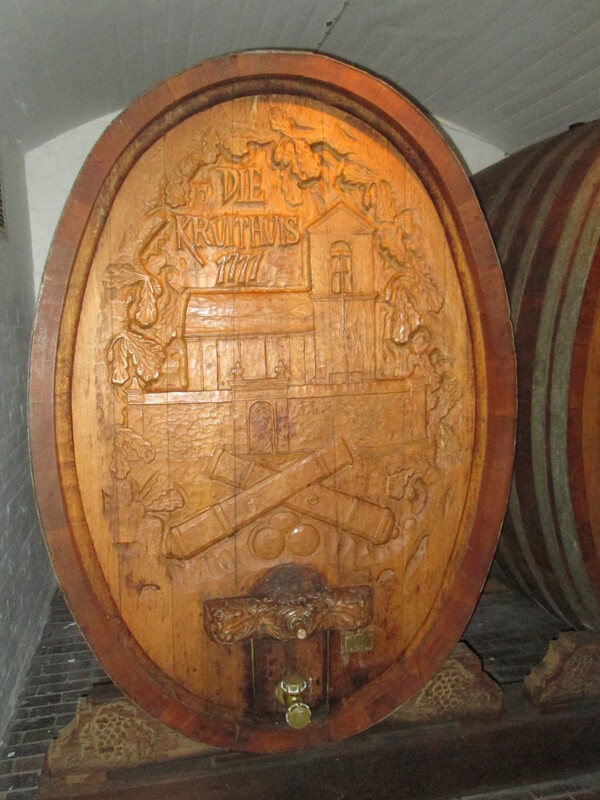 First stop on the tour was the room where the barrels are stored, as you enter the heavenly aroma embraces you. I asked Dillon if there is a special word for that scent, apparently not but there really should be! Maybe something like “viness”, any suggestions? 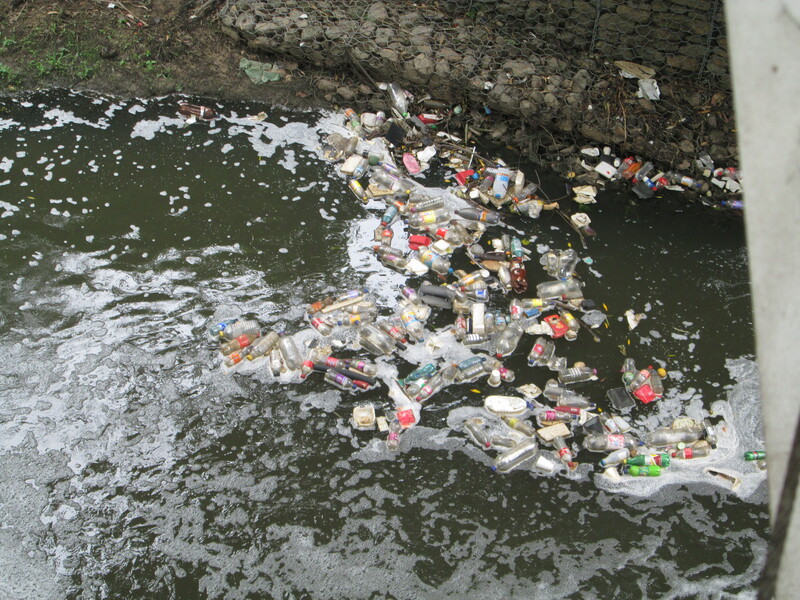 As part of the tour we crossed a pretty bridge over a disgustingly polluted river looking over the edge the litter was depressing. I know that Distell aren’t responsible for the river but it would be an excellent social responsibility move if they could somehow take charge of cleaning the section which passes through their property. Perhaps they can get some advertising mileage out of doing so. 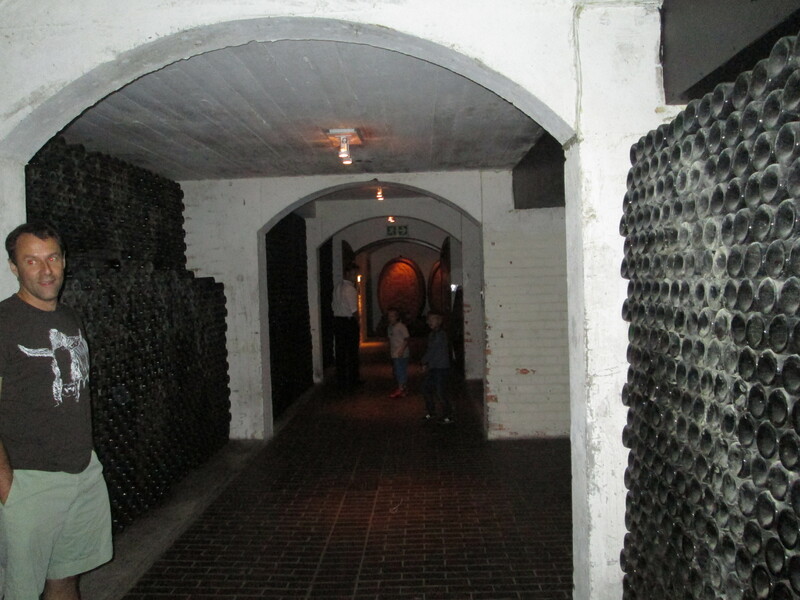 Our wine tasting took place in old underground cellars, The walls are all lined with full bottles of old wine which forms part of the decor, this creates a great authentic feel but somehow conflicts with my waste-not-want-not mindset. If I were told the varieties of wine on the tasting list I would have expected my favourites to be Chardonnay and Cab Sav however I loved the first and last tastings the most, those being the Savignon Blanc (which I almost never drink) and the Nobel Late Harvest. After the tour I was quite pleased with myself to note that these two were the award-winning wines of those which we tasted. The unfiltered 2013 Savignon Blanc won the Vertitas gold award and is a Classic Wine top 6. The Nobel Late Harvest is also also a Classic top 6 wine. As a pleb whose first experiences of wine drinking were giggling over a bottle of Autumn Harvest Crackling with my friend Lesley I forever forfeited any claim to be a wine snob, this goes to show that you don’t have to be a poncy pro to know a good wine. My enjoyment of the Savignon Blanc may be explained by the fact that this wine was unfiltered. Cliff asked Dillon if we could compare the filtered and unfiltered versions of the same wine. At the end of the tour we tasted both the filtered and unfiltered both 2013. 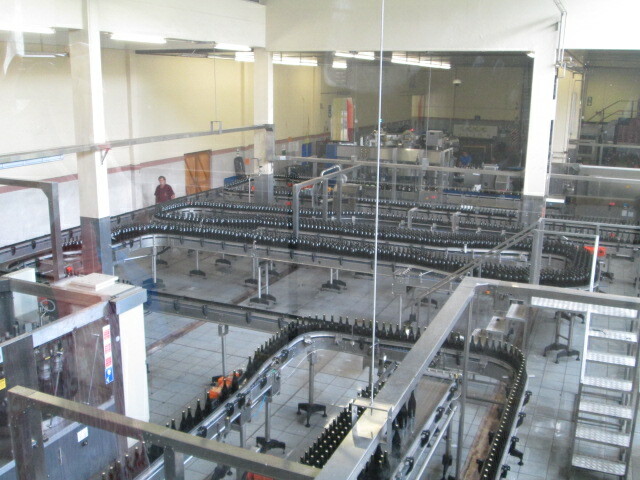 The unfiltered is made by placing Bentonite clay at the bottom of the tanks, the wine is then taken from the top, apparently this process retains more terroir notes (bear in mind that I am a pleb and may not have retained the scientific part of this information properly). When tasting the filtered and unfiltered wines side by side it was like tasting 2 different wines. Cliff rounded off the tasting with a port and sherry tasting, he was particularly impressed with the Monis 2001 Muscadel, a deserving Veritas double gold winner. He bought 2 bottles with the intention that we drink one next winter and keep the other for many years.